Printed in London, 1732. From Herman Moll's "A System of Geography". California is shown as an island, with over a dozen place names. The cartography of the Southwest is remarkable, for the certainty of the detail stands in stark contrast with just how little was actually known about the region at this time. The extent of the Missouri River is especially interesting in this regard. A note at the source of the Mississippi states that the Artes of France are cut into this tree and a northern Recolet Mission is also illustrated. Indian tribes, the early French and English Forts and the settlements in the Great Lakes regions are also detailed. In very good condition. Refs: Wheat 81, Wagner 487, McLaughlin 144. 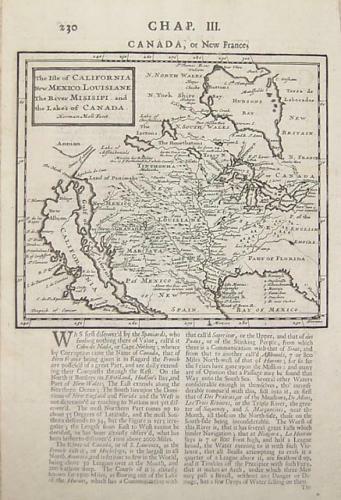 Title: 'The English Empire in America...' Printed in London, 1732. From Herman Moll's "A System of Geography". In very good condition, set in a page of text.